The 11t September attacks, aften cried 9-11 juist, wis attacks on the Unitit States bi Islamic terrorists on 11t September 2001. Twa hijackit aeroplanes wis flewn intae the World Trade Center, collapsin its twa touers an causin the daiths o aboot 2500 fowk, forby the fowk on the aeroplanes thairsels, aboot five hunner mair. Anither aeroplane wis flewn intae the Pentagon, killin 125 fowk. A fowert plane wis on coorse for the White Hoose in Washington D.C. Houaniver, the passengers in thon plane attackit the hijackers, causin the plane tae crash-laund afore it reached its intendit tairget. Acause o thir attacks, Preses George W. Bush decidit tae hae Americae lench a warld wide war agin terrorism. At the time al-Qaeda, the fowk ahint the attacks, wis operatin oot o Afghanistan that wis unner the owerins o the Taliban. George Bush invadit Afghanistan for tae pit the branks on al-Qaeda an the Taliban. 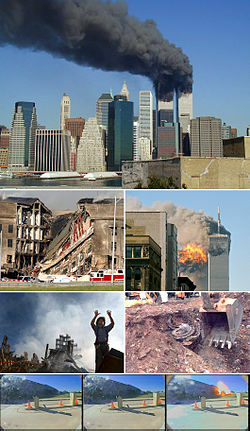 Wikimedia Commons haes media relatit tae September 11 attacks. This page wis last eeditit on 11 September 2018, at 04:36.